Grow into a strong runner with the best running shoes designed for your feet. Every runner is unique. That’s why you don’t want to fixate on your running shoe’s logo. Instead, you want to pick a shoe that suits your running style and matches your feet. Today, we scour the market to find running shoes that standout among the rest. From comfort to cushioning, support, and weight, we are not leaving any stone unturned. Before we delve on which are the best, there are a few pointers you need to lead you in the right direction. Ask yourself; what kind of a runner are you? Do you prefer the treadmill or are you a trail or Roadrunner? When you have defined your running style, then you can understand why some running shoes have heavy traction while others are light with less grip. The way you run also determines the shoe you pick. Here we are talking about pronation. Are you a natural runner or do you over-pronate or supinate? After that, choosing the running shoe for you should be easy as you find out whether you want neutral shoes, stability, motion control, or barefoot shoes. Here, we’ll discuss these different types of shoes and decipher who will benefit the most from these models. From the trails to going to the gym, we have something for every lady. In the running world, you only want to make subtle compromises like the color and not something to do with comfort. Brook’s Women Adrenaline GTS 18 is designed for road runners who overpronate. It provides a customizable fit thanks to the asymmetrical midfoot saddle that offers substantial cushioning for a secure fit. It supports the arch and keeps the foot stabilized such that your ankle will not roll too far inward. We love that it combines a smooth mesh and synthetics to give it a single unit on the upper. It feels so smooth that it is comfortable to hit the road without fear of sweating your toes off. The toe area leaves room to wiggle without being too wide. It comes true-to-size, so no worries whether you have to pick a size up or a size down. Looking at the cushioning system, Brooks employs their removable molded foam mid-sole which conforms to the curves of your feet. Not to mention, it explores BioMoGo DNA system that ensures you have a fluid ride. 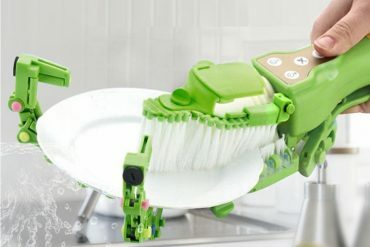 It entails a cushioning mechanism that will adapt to the exact way your foot applies pressure. It cushions every bit of the mid-sole instead of just the toe and heel areas. The result is a custom ride aimed at speed and strength. The blown rubber forefoot combined with the full-length crash pad delivers durable performance. It helps proper transitioning from the heel to the toe. It also enjoys a Flextra rubber outsole with deep V grooves for a maximum road to shoe traction. 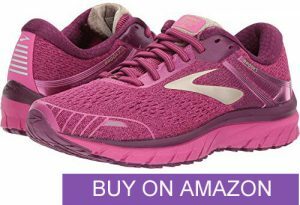 Brook’s Women Adrenaline GTS 18 is all about comfort and support. If you want soft cushioning and a smooth ride, you can’t go wrong with this pick. Considering the trail runners are heavy shoes that hit the 10-ounce mark, Asics Venture 5 is deemed to be lightweight at only 8.7 ounces. It is built to handle the stress of running on rough trails replete with rocks, paddles, and roots. This shoe maintains a high level of stability owing to the heavily stitched uppers and neat overlays that ensures your foot will always be planted to the ground. You have the assurance of not dealing with free motion especially since there are numerous hazards on trails. With its durable mesh still on the upper, Venture 5 does not only fit snugly, but it also ensures breathable performance over long distance running. You will like that it uses multi-directional lugs on its rubber outsole to maintain traction on every type of trail. What’s more, this shoe offers a gel cushioning system in the midsole. It is profoundly shock absorbent such that pressure is spread out from the heel to the toes hence reducing the risk of injury. You can’t go wrong with the unique fit of Venture 5. You don’t need to go looking for a running shoe finder if all you need is the proper kick to hit the trails. 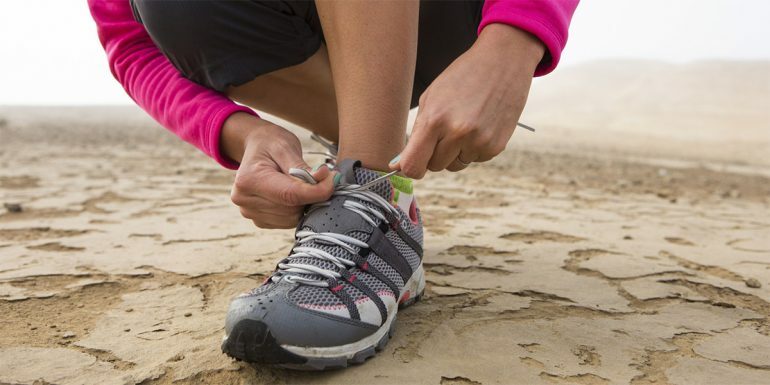 Don’t let pain from plantar fasciitis keep you away from your favorite form of exercise. New Balance got your back with the Women’s w990v4. Though a neutral shoe, you will like that it can be worn with orthotics which conform to your feet. This shoe has a 12mm drop. It cradles the foot in that you will feel stabilized at all times. 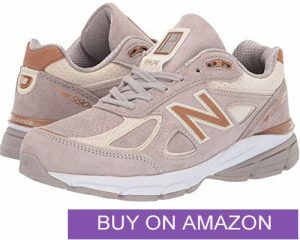 You will find that with the ENCAP midsole technology, New Balance w990v4 supports the arch to relieve pressure and prevent pain to the heel and even cushion along the whole foot. For breathability, it has a pigskin upper that is equally sturdy. It fits snugly and feels nice against the foot. Better still, it comes with dual density collar foam to help protect the ankle and prevent it from rolling. The blown rubber outsole is robust no doubt. It should take you through miles on the road. It is a bit bulky for everyday running say in the gym weighing in at 11.1 ounces. Nevertheless, it is designed with high traction especially on gravel and wet surfaces. If you have more than just plantar fasciitis, grab the Gravity Defyer G-Defy Might Walk. With the help of advanced shoe technology, this model helps to steer clear of bunion, heel, diabetes pain and many other forms of pain. When choosing a running shoe, you will rarely find a shoe that addresses numerous kinds of pain. That’s why, even if it has a high asking price, Gravity Defyer is worth as the best runner. 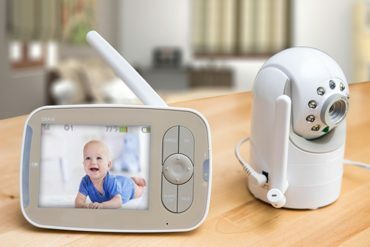 First, it has its exclusive spring system using Veroshock technology. It absorbs impact from every step converting it into renewed positive energy. With the Gravity Defyer G-Defy Might Walk you can walk and run longer since it exempts you from the stress and fatigue that hits the feet every time you land. It also has an extra roomy toe box that keeps bunion pain at bay. 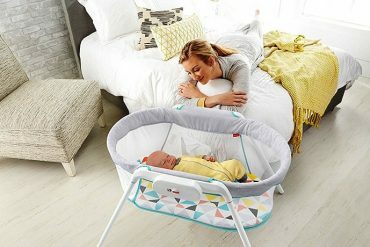 You will have enough room to wiggle your toes. The best thing about this shoe is that it has a 30-day trial period. If you don’t like the pair, you can send them back without feeling guilty of walking into a running shoe store. 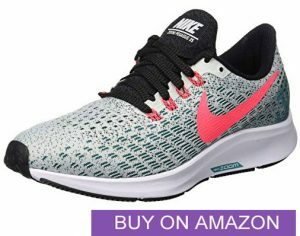 Nike is a top brand and ranks high on how to buy running shoe searches. If you are an aspiring athlete, Nike Women’s Air Zoom Pegasus 35 is built for speed. 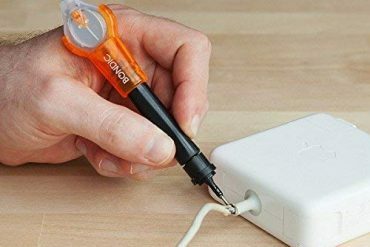 It is a popular model mainly because it is lightweight and budget-friendly. The upper sits on a full-length Zoom Air Bag that makes the shoe comfy and lightweight. It is a model you will want for both indoor and outdoor runs thanks to the super light feeling that it gives the feet. 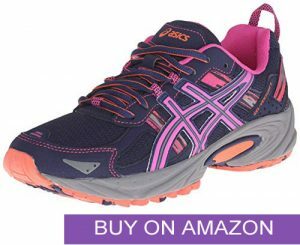 This shoe receives superior cushioning that with a beveled heel and resilient Cushlon ST foam. It provides high responsiveness so that you can sprint faster without losing your balance when you land. No wonder it is a favorite among dancers and short distance runners. With the inclusion of a thick heel collar, we find it gives you a snug fit while allowing room for flexibility. Not to mention, it has a flymesh upper construction to prevent heat and moisture buildup. As such, it remains fresh so that you can enjoy runs free of retained odors. 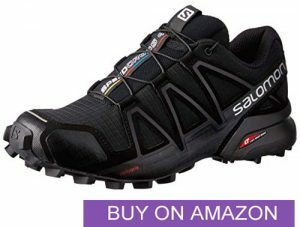 Salomon Women’s Speedcross 4 will get you running through the roughest patches of the outdoors. With a waterproof and debris-resistant upper mesh, it eases the worry about running into puddles or encountering rain. That said, this is a durable shoe that comes with their legendary Speedcross lug pattern to handle just about any soft or rough terrain. Whether you are contending with muddy trails or rocky mountain paths, it has monster lugs to chew up through any surface. The chevron-shaped lugs are 6mm in length and sit in multiple directions to allow the shoe to shed mud much more easily. Complemented by the rubber outsole, it does better on slimy rocks thanks to the additional grip. It also comes with a mudguard that is handy to protect your socks and feet at all times. When it comes to the cushioning, Salomon Speedcross 4 has a Sensifit mechanism to cradle the foot from the heel to the toes. It provides a secure fit customized to the way your foot sits on the midsole. Enjoy the nature and the outdoors with sneakers made to handle it all. 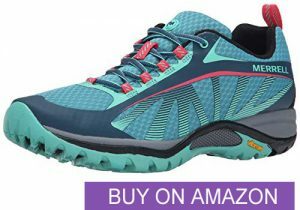 Merrell Women’s Siren Edge Hiker looks and fits the part. From the first time you wear these kicks, you will find it comfortable and ready to hit the trails. It is also an outdoors shoe owing to the waterproof, seamless upper overlays and the Vibram outsole that grips well. More on the outsole, it has been deemed to tread on loamy forest soil to the jagged desert outcropping and rocky mountainous trails. And no worries about forming blisters and hurting your toes when you hit on roots and rocks. This is because it has a roomy, protected toe box. Its bellows tongue is debris-resistant which prevents small rocks from entering the footbed. And if you are running in sweltering weather, it comes through with the odor-resistant footbed that keeps your feet fresh run after run. 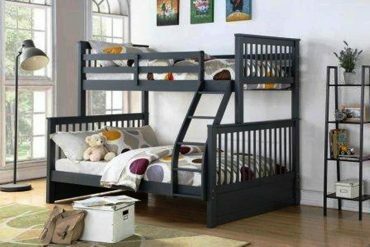 We also like that it has a molded nylon arch shank that supports the arch and underfoot. 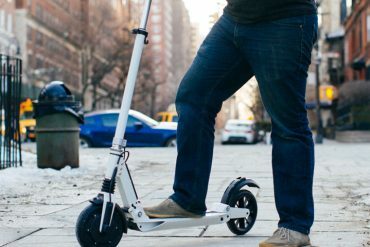 It protects every landing such that you won’t risk rolling the ankle. It is a high-quality shoe that does not come close to the price offering of other brands since it is affordable for most people. Only when you hit the miles will you know if you picked the right shoe from your nearest running shoe store. Before then, you will want to know how to choose running shoes according to your specific requirements. You will find many athletic shoes on the market. They differ in the sense of running shoes vs training shoes, roadrunners, and trail runners. 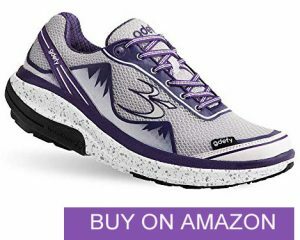 Training Shoes: These shoes are meant for indoor runs like in the gym or indoor tracks. 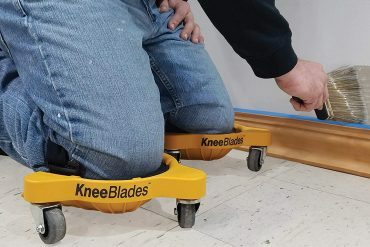 They take on impact and have great traction to deal with smooth surfaces. Roadrunners: If you like hitting the pavements, you will want supportive, lightweight shoes also with impressive traction. They should protect the joints and reduce the risk of injury. Trail Runners: When facing off rough trails, you don’t want a rock pushing into the outsole of your foot. Such sneakers need to have massive traction and thick outsoles. The toe area should also be dense such that you won’t hurt your toes when you hit on rocks and roots. Running shoes are built for the smooth transition from the heel to the toes. Training shoes, on the other hand, are made for side to side movement. As you can see, athletic shoes are not built the same. Running shoes cater to different feet types from over-pronation to supination and neutral runners. Training shoes are made for the gym. They support a wide array of movements from jumping to stopping, cutting, and even breaking. If your routine involves lifting weights, aerobics, cardio training, outdoor boot camps, you will want to go with a training shoe rather than a running shoe. 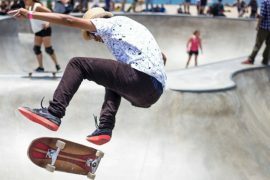 Apart from discomfort, there are risks to wearing the wrong type of shoe. First, you could easily get injured say you are using running shoes for training. This is because they do not support the kind of movements you undertake in the gym. Not forgetting, you may not achieve your running potential if you are in the wrong kind of shoe. Training shoes are heavy and may hinder your speed. If you are competing, it means not standing a chance of finishing where you anticipated. It determines how you run in the sense of whether you are an under-pronator or overpronator. For neutral runners, you have a high arch and tend to balance how you supinate and pronate and are at a lesser risk of injury compared to other types of runners. As such, you will want to buy running shoes that are lightweight and neutral. If your foot rolls inward when you run, you overpronate. Running shoe should be well-cushioned and supportive around the ankles and the arch to keep you from injuries. For supinators, you may find that your ankle rolls outwards or it does not roll inward at all. It forces the toes to do all the work of shock absorption which puts you at risk of injury. 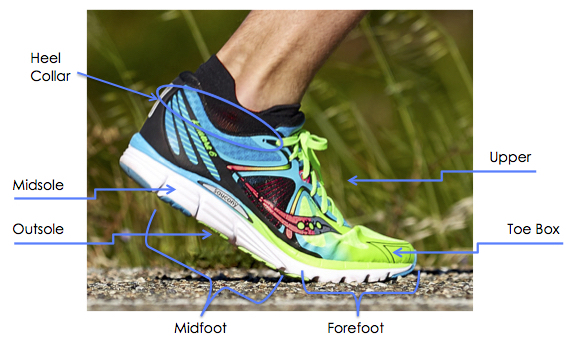 There are three significant parts of a running shoe: the upper, midsole, and outsole. When examining the upper, it should look for one that is flexible in that it follows the curves of your feet. The midsole determines the cushioning. It should not be too pliable or too firm. When looking at the outsole, you will want it to withstand wear from the surface you run. Be it the road, trails, or the gym. Look for durable materials like rubber which provides traction without adding significant weight to the shoe. And don’t forget to look for a reinforced toe box that will hold together the upper while allowing flexible toe movement. Also, pay attention to the way the ankle collar cradles your ankle. For controlled movements, the collar should not let your foot slip forward. Be the best runner you can ever be by picking a shoe that feels comfortable, supportive, and lightweight. 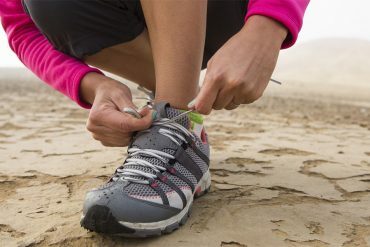 We have selected the Best training Shoes Vs running shoes for Women’s ideally. They are designed with a few ounces lighter than men’s and that they are responsive and tailored to the needs of specific persons.